Venezuela President Hugo Chavez: Not pleased with Hillary's Latin tour. "She comes to Brasilia to show disrespect to Brazil, disrespect to South America, disrespect; she comes to intrigue and to sow discord, saying that Venezuela is continuing to erode democracy and that whole story … Mrs. Clinton, who, like Condoleezza Rice, only this time a blond one, came to Brasilia to attack Venezuela." 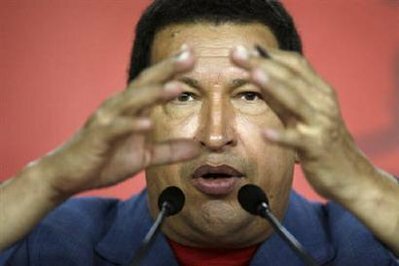 Hugo Chavez, the president of the Bolivarian Republic of Venezuela, has called recent statements made by U.S. Secretary of State Hillary Clinton an aggression against our country. President Chavez said that he spoke with Brazilian Foreign Minister Celso Amorim, and he noted a "cute remark" Rio's top diplomat made to the secretary of state. "I spoke with Celso Amorim and he told me of a very funny remark he made to the secretary of state, Mrs. Clinton, who, like Condoleezza Rice, only this time a blond one, came to Brasilia to attack Venezuela," Chavez said. "Mrs. Clinton comes, and shows right in front of Celsus - who is a great friend - disrespect to Brazil, disrespect to South America, disrespect; she comes to intrigue and to sow discord, saying that Venezuela is continuing to erode democracy and that whole story; that Venezuela should look south and follow the example of Brazil or Chile. … Then Celsus, after standing near this lady who was saying all of this, made a comment and put her on the spot: he said he didn't agree with everything the secretary was saying, except for the part about Venezuela now looking south. And with very fine humor, he said because yes, we are now to the South," related the president. In this regard, the president considered that her statements amounted to an, "international aggression, which is undoubtedly a concerted assault. It is a concert, an orchestra, and it is the U.S. empire pulling all the strings in Spain, in Europe; nor is anything said of this in the great newspapers of the world, the major newspapers, television stations, and television networks." In another vein, the Venezuelan president announced the arrival of the first shipment of humanitarian aid and a group of 27 Venezuelans, to boost cooperation with Chile after it suffered a devastating earthquake there.